All crime is legal for 12 hours. While many decide to barricade themselves for protection, others participate in the mayhem. The New Founders of America invite you to celebrate your annual right to Purge. The Purge: Anarchy follows an unlikely group of five citizens who, over the course of the night, are hunted across the city in a kill or be killed series of survivor scenarios during the annual Purge. Will they survive the night? Sounds good, no? The giveaway will run from now until July 25th. The winner will be announced shortly there after. Each household is only eligible to win One (1) The Purge Prize Pack chosen at random via blog reviews and giveaways. Only one entrant per mailing address per giveaway. Must have a residential address. Sorry, no PO Boxes. If you have won the same prize on another blog, you will not be eligible to win it again. Giveaway is open to US residents only. Winner will have 48 hours to respond to winner's Email notification. If a response is not received by the end of 48 hours, the winner will forfeit their prize and a new winner will be chosen. Prize will be shipped by PartnersHub. Winner is subject to eligibility. As usual, all I ask if a little reader interaction. 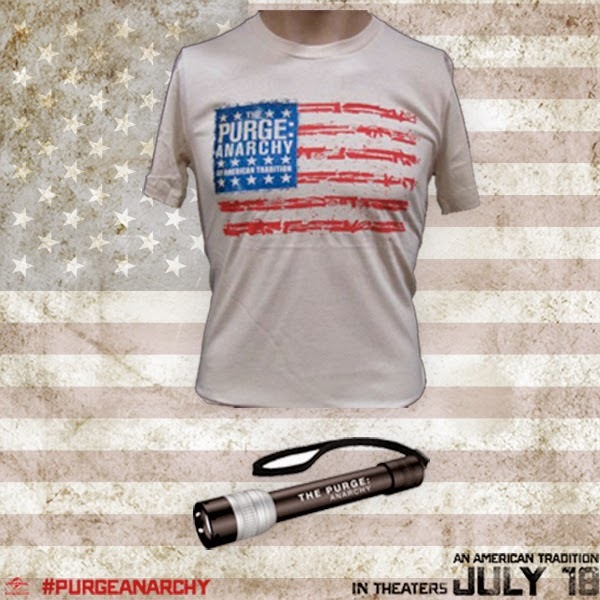 Check out the below 5 things to know about The Purge: Anarchy. Which fact is your favorite? What would you do if you were caught outside during a Purge? Leave a comment with how you plan on surviving and enter using the giveaway widget below! Good luck and once the film is out, keep an eye out for my post giving my thoughts on The Purge: Anarchy! Later! I would hide the whole time! Maybe use my pepper spray if I had to! This is a very scary thought, but I can't wait to see the movie! Scary thoughts indeed, Lissa. Good luck! Avoid others, stockpile weapons and when in doubt, pull the trigger. I would find several tough guy types and get them to let me stay in their underground bunker. I would get an expensive security system and hide too. I would have a safe room to hide out in with heavt artillery until it was all over. I'd hide with my family, heavily armed. My survival plan would be to build a false wall in my house and put myself in a room (like a saferoom). The trailer for this movie scares the CRAP out of me!